FCI alum Melissa Murphy (Culinary '95), owner of Sweet Melissa's bake shops in Brooklyn, won the Almond Board's Marzipandemonium! Small Indulgences Recipe Contest for an updated take on the traditional fruitcake. Get the recipe and read her new bi-weekly column in The Brooklyn Paper. 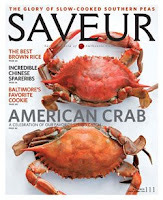 Michael Courey (Culinary '98) is in this month's edition of Nation's Restaurant News. 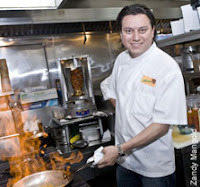 The feature length story covers Michael's love of Italian and Mexican cuisine and some of his favorite ingredients; wild boar, mexican chocolate, epazote and chipotle. Read the full story at the Nation's Restaurant News Website. David Chang (Culinary '01) is featured in a video piece on men.style.com. In the video clips he goes into detail about his obsession with reading and collecting cookbooks. View the video at men.style.com. Jamie Tiampo (Culinary '06) and the Dell’Anima team opened its second, more spacious restaurant on Dec. 3. 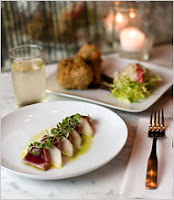 L'artusi features a similar menu with rustic Italian cuisine. Read more about L'artusi at the Gothamist. 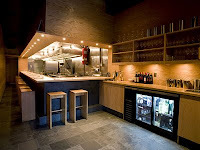 David Chang's (Culinary '01) Momofuku Ssam Bar was recently revisited by The New York Times' Frank Bruni. Bruni gave Ssam Bar an extra star since his last review, making the total three stars. Christina Tosi (Pastry '04), the Pastry Chef for the newly opened Momofuku Bakery & Milk Bar, is also mentioned in the review. am New York interviewed Kee Ling Tong (Pastry '00) about her chocolate creations. The interview spans such topics as her unusual flavor combinations and her inspirations. Kee runs Kee’s Chocolates on Thompson Street, New York. Read the full story at am New York, or visit Kee's Chocolates online. Christina Tosi (Pastry '04) will be heading up the latest Momofuku project, Momofuku Bakery and Milk Bar. Both Tosi and the opening of the Bakery got a nice mention in Florence Fabricant's Food Stuff. Dave Arnold, Director of Culinary Technology at The FCI, was celebrated in Esquire Magazine’s seventh annual “Genius Issue.” Frequently consulted by some of the world’s most innovative chefs, Arnold continues to push the technical limits of food and cooking. Click here to read the article. FCI Alumni and James Beard Award winners, Vitaly Paley and Marc Vetri published two new cookbooks. Vitaly Paley (Classic Culinary Arts '90) just published Paley's Place Cookbook: Recipes and Stories from the Pacific Northwest. The recipes are from Paley's Place Bistro and Bar in Portland, Oregon, and are adapted for the home cook. Buy the book at Amazon. Marc Vetri (The Art of International Bread Baking '98) published Il Viaggio Di Vetri, along with sommelier Jeff Benjamin. The book showcases Italian classics, each with accompanying wine notes. Buy the book at Amazon. In an anonymous survey of 40 New York City chefs conducted by Time Out New York, Nils Noren, VP, Culinary Arts was voted by his peers as "the chef that should have gotten an award by now but hasn't." Congrats Chef Nils! Chef Wylie Dufresne (Culinary '93), Chef-Owner of the innovative Lower East Side hotspot wd~50, gives Kurt Andersen of Studio 360 a lesson in high-tech cooking. Check out the slideshow and see how Chef Wylie does Eggs Benedict. The Craft of Food Writing received a great review on Serious Eats. Click here to read the review. Taught by celebrated food writer and Dean of Food Journalism Alan Richman, The Craft of Food Writing is an intensive six-week class covering all aspects of food journalism, from basic reporting skills and writing food reviews to how to pitch an editor. Click here to learn more about The Craft of Food Writing. Nick Fauchald (Culinary '04) is the Editor for the newly launched Tasting Table, a daily email newsletter for New York City foodies. 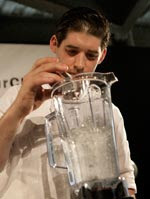 Nick previously contributed to Food & Wine Magazine and other high profile food publications. Visit Tasting Table and sign up for the newsletter! Marco Ferraro, a French Culinary Institute alum, is the new executive chef at Wish restaurant at the Hotel of South Beach. Chef Ferraro has trained at Jean-Georges, Le Mantel in Cannes and Le Muscandin in Mougins and made his mark at Jack's La Jolla in California. 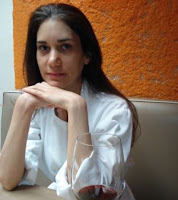 You can taste Chef Ferraro's menu at Wish beginning in September and find the rest of the story at the Miami New Times. Congratulations to Anne Khoobiar (Pastry '05) for winning the Show Stopper award at the Somerset Art Association's "The Art of Cake Design" competition this spring. She dazzled the crowed with her "Bloom of the Ball" party dress cake. This is one dress that's sure to impress. Read all about what it took to create the party dress cake. Ted Allen, the Iron Chef America and Top Chef judge with a new show on the Food Network, profiled Dave Arnold on Popsci.com. Chronicling the FCI's food technology instructor's culinary experimentation from deep-frying beignets as a fifth grader to building the first vapor oven to creating a fizzy gin and tonic with clarified lime juice and infused gin, Ted Allen highlights the innovations that Dave Arnold and chefs such as Wylie Dufresne (CA '93) have brought to the culinary world. For the food techie, Doctor Delicious conjures up images of new culinary heights. Restaurateur and chef Umut Ozkanca (Culinary '01) was featured in the Turkish Daily News on Monday. He operates some of the hipest eateries in Istanbul and credits their success with his effort to keep his prices as reasonable as possible. "We have a principle that customers should make the most of the money they spend at the restaurant." Enjoy the complete article by clicking here. Anthony Spinella ('90) recently opened Andiamo in Los Angeles. 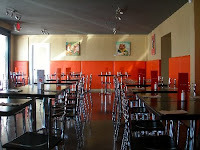 The menu, which offers soups, salads, panini, pizza and pastas, is based on old family recipes and utilizes produce from local growers. Open only two months, "it’s already a welcome casual addition to the Silver Lake dining scene." For some food photos, discussion of the pizzas and a link to the restaurant, click here. 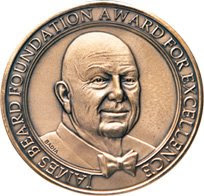 M.J. Adams (Culinary '89) is one of the guest chefs at this year's James Beard Foundation Awards Gala Reception on June 8th. M.J., chef and owner of The Corn Exchange in Rapid City, South Dakota is amongst great company at this event. Click here to view the complete list of guest chefs. Matthew Kenney (Culinary '90) and Sarma Melngailis (Culinary '99) have added to their growing list of cookbooks. Matthew with his fourth offering, Everyday Raw and Sarma with her scond, Living Raw Food. Congratulations on their continued success! StarChefs.com interviewed Dave Arnold for their "Cool Careers" column. During the interview, they brought Dave a duck as an experimental challenge. Gladly accepting the challenge, he answered their questions about his job inbetween deboning, sous viding and deep frying. To read the interview and recipe, visit starchefs.com. New York magazine's Adam Platt has awarded four stars to Momofuku Ko, David Chang's (Culinary '01) newest edition to his growing list of restaurants. The ten-course prix fixe menu is constantly evolving, but Platt gives special mention to the foie gras, deep-fried short rib, and cereal-milk panna cotta. You can reserve one of the 12 seats at the bar one week in advance on Momofuku's website, but be prepared, "they’re gone not in minutes but in seconds." Read the full review at nymag.com. Culinary grad Laurent Dallet ('07) is taking a look back at his first year in New York in the latest entry on his blog, Le Chef Bleu. 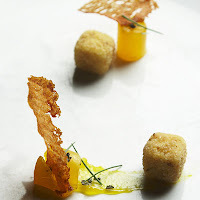 Following graduation Laurent began working as sous chef at The French Consulate in New York, where he enjoys his work, whether it be cooking for the Consul General's family or catering official receptions. To read the full posting, visit Le Chef Bleu. 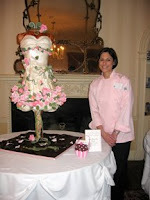 Congratulations to Anne Khoobiar Heap (Pastry '05) of Pink Cake Box in Denville, New Jersey. Anne and her specialty bakery were recently featured on CNN Headline News as one of their Small Business Success stories. To see Anne's segment, visit CNN.com . Steven A. Shaw, Executive Director of eGullet, recently found himself dining at L'Ecole, following an appearance as guest speaker in Dean Alan Richman's Craft of Food Writing class. He was "pleasantly surprised by just about every element of the meal." Congratulations to the entire L'Ecole staff. To read the full posting, visit egullet.org.